Distilling ships were usually tankers converted to have the ability to produce large quantities of fresh water from salt water. However, distilling ships refilled from natural freshwater sources whenever possible to save fuel. (Distilling is a very energy-intensive process.) They were typically stationed at forward bases where they could replenish the water supply of freshwater-poor ships or provide water to the base itself. The stills on American distilling ships typically were of the Kleinschmidt vapor-compression type. It requires a minimum of about 2,600 kJ per liter (9,200 btu per gallon) to boil water that starts out at room temperature. This is equivalent to the combustion of about a gallon of fuel oil for each 18 gallons of distilled water produced. In practice, the efficiency of ordinary stills was typically as low as a gallon of water for each gallon of fuel. However, the Kleinschmidt still recycles much of this energy by compressing the steam from an evaporator and using this superheated steam to boil the salt water coming into the evaporator. The compressed steam condenses into very hot distilled water that is then routed through a preheat unit that heats the salt water coming into the evaporator. The hot brine left over from the evaporator is also routed through the preheat unit to recycle its heat. The only energy input to the still is the energy used to compress the steam. A well-designed Kleinschmidt still can produce 175 gallons of distilled water for each gallon of fuel consumed. It was found that keeping the water from going foul was surprisingly difficult. 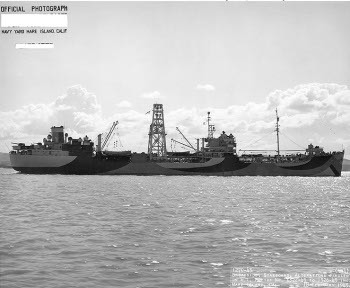 Each ship had a naval surgeon and staff to test and maintain water quality, but in the tropical heat, bacteria multiplied on the least nourishment and many loads of water had to be dumped due to contamination.